Hey everyone! How was your weekend? Doesn’t it always go a little too fast? We ordered a new exercise bike (a spin cycle) which is arriving today. I plan on mixing up my exercise regime with a circuit kinda thing – some treadmill, rowing and then cycle. Maybe some squats in between. I’m actually looking pretty forward to it! What do you like to do? I love to work out because I also love to eat (story of my freakin’ life, lol). Gotta have balance, am I right? Did ya indulge too over the past couple of days? Tell me I’m not the only one. Get yourself back on track with these easy vegan black bean burgers. 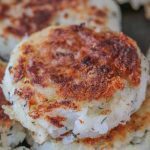 They can be prepped in advance and fried up just before you want to enjoy ’em so they are awesome for when you are meal prepping for the week ahead. 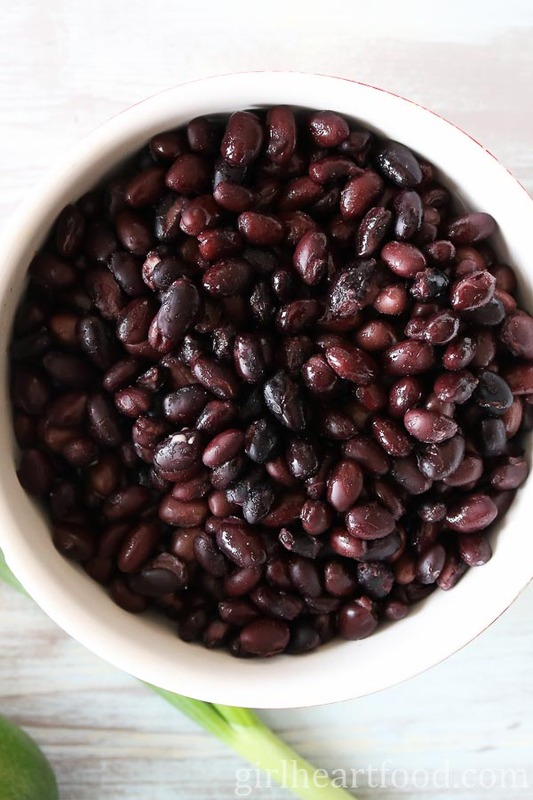 Benefits of Black Beans – why are they so great? They are super versatile! They can be used for burgers (like this vegan black bean burger recipe), soups ,dips, and lettuce wraps. Black beans are loaded with fibre and vitamins. Like most beans, they are inexpensive (woot woot). Rinse and drain (very well) black beans. Reserve some for later. To food processor, add remaining beans along with lime juice, smoked paprika, garlic powder, cumin, cayenne, organo, salt and pepper. Blitz until combined, but still some visible beans left. Remove mixture from processor and add to bowl along with reserved beans, green onion, oats and bell pepper. Stir to combine. Form into patties (use an ice-cream scoop). Can I Make This Vegan Black Bean Burger without a Food Processor? Don’t have a food processor? No worries! Use a potato masher in conjunction with a spoon. You may have to use a little elbow grease to break them down, but it will work! How Long Do These Black Bean Burgers Last in the Fridge? Properly stored in a container, these bean burgers will last 3-4 days. Alternatively, you can freeze in freezer safe containers and thaw when ready to cook and enjoy. Ensure that the black beans are well drained and even patted dry of excess moisture before using in this recipe. Don’t overly process the beans. You don’t want ’em too ‘mushy’. If your bean patty mixture is too wet, add a little more oats, about a tablespoon or so at a time until they are easy to form into patties. Want more texture? Stir in up to 1/2 cup of chopped walnuts when adding oats. After the veggie burgers are formed, freeze for a little. This makes them way easier to handle when cooking. I always prefer to use a cast iron pan when cooking these black bean burgers. Fry these black bean burgers in batches (two at a time) and add a little oil for each batch. If you like, you can add a little more seasoning (aka salt and pepper) before you fry these burgers. Like it a little spicier? Add a little more heat cayenne to the mix! You do you! These burgers freeze really well. 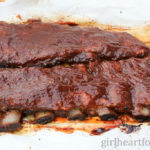 You can prepare, place on a sheet pan and freeze for when you want to enjoy them later. Don’t want to enjoy these as a burger? They are delicious fried up with a poached egg on top for breakfast. 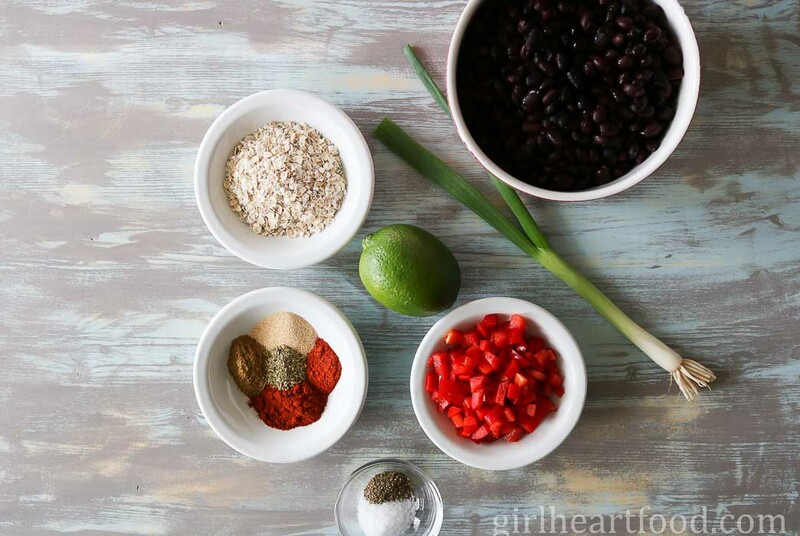 Black Bean Burger Toppings – the options are limitless! Cheese (use vegan cheese if you want to keep this burger straight up vegan). And, if you’re looking for a delicious side to have with these bad boys, try some homemade fries from Lisa over at Garlic and Zest. Hope you get to try these vegan black bean burgers soon (I happen to think they’re the best black bean burger recipe 😉 ) ! P.S. 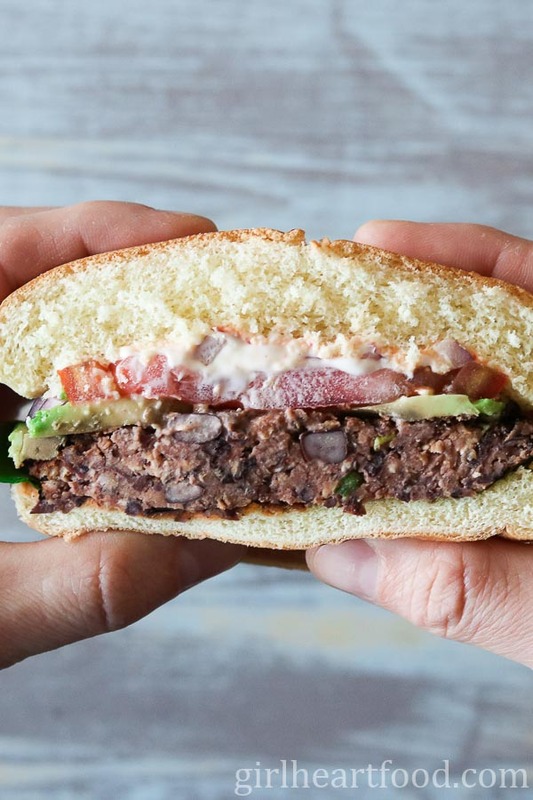 If you think this Vegan Black Bean Burger recipe will make your belly happy too, please be sure to hit that little Pin button down below. 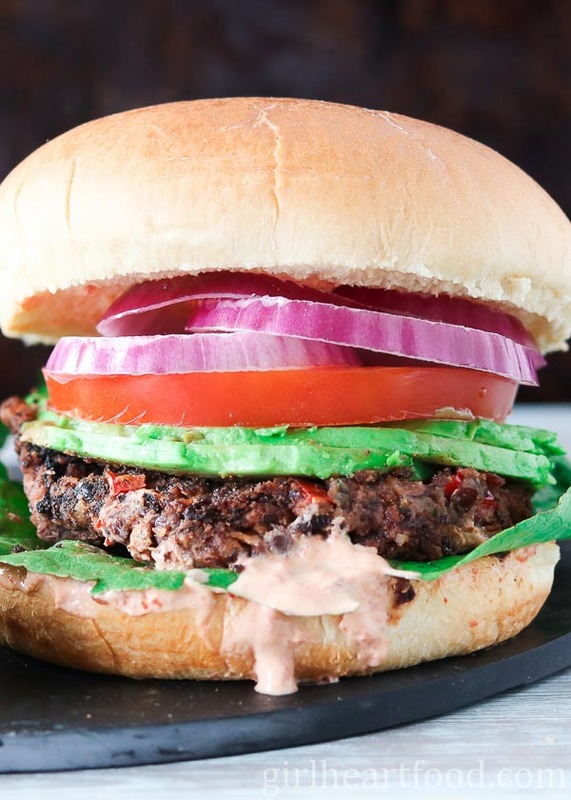 These Vegan Black Bean Burgers are the best black bean burger recipe you'll try! They're made with pantry staples and freeze really well for days when you are too busy to prepare dinner. Garnish them to your tastes with ingredients like red onion, tomato and avocado. They make for one yummy meatless dinner! Ensure beans are rinsed, drained well and even patted dry. Reserve 1/2 cup black beans and lay to one side. Add remaining beans to food processor, along with lime juice, smoked paprika, garlic powder, cumin, cayenne, oregano, salt and pepper and blitz until mixture comes together, but still some visible beans left. Remove from processor and place in a large bowl. To bean mixture add reserved half cup of beans, green onion, oats and bell pepper (if you want more texture, also stir in up to 1/2 cup chopped walnuts). Stir to combine. Using a round standard ice-cream scoop, form into patties, with each patty being about a scoop and half (roughly). Place patties on wax paper lined tray and freeze for 45 minutes. Remove patties from freezer. In a 10 inch cast iron skillet over medium low heat add 1 tbsp olive oil. Season burgers with a little extra salt (if desired). Cooking two burgers at a time, cook about 3 minutes per side. Remove. Cook remaining batches (1 tbsp of olive oil per batch). Place on toasted bun and garnish as desired. Enjoy! Don't overly process the beans. You don't want 'em too 'mushy'. A bit fragile when cooking but next time I would add some flour oatmeal. I put the burger set in the fridge instead. I added red quiona and add more or less some spices i also add nutrional yeast. It’s was very good burger with homemade McDonald’s sauce ! I did the sauce vegan or sometime vegetarian ! Next time in the burger mixture i will add sliced mushrooms. So happy to hear that you enjoyed them, Faniy! Thanks for letting me know 🙂 If you added quinoa you would definitely be adding to the moisture level of the burgers and would need to add a little more oats. Freezing also works best before cooking. Hope you have a wonderful week!! Wow, that is some exercise regime you’ve got…that is terrific. I like the idea of serving these without the bun and topping with a poached egg. I am always looking for new black bean burgers. These are absolutely wonderful. You have made these so easy and delicious to make and I’m making a few to freeze. I love black bean burgers!! But for some reason, I have never made them myself. I am drooling here!! Beautiful burgers!! I love black bean burgers and these are seasoned perfectly. Such a great meal to sneak some healthy into your week. Also love that these freeze well so you can always have them on hand. I love beans and I’m always looking for more ways to add vegetarian dishes to our menu. Can’t wait to give this a try. I’m sure it’ll be a huge hit in our household! I love me a good bean burger!! This looks amazing and so thick!! Pinning to try soon! Same here! Thanks Sam 🙂 Hope you like these! I’ve had some preeeeeeetty terrible black bean burgers in the past. I think it’s time I make my own so I KNOW it’s going to be good! I NEED black bean burgers in my life! Yours look absolutely awesome! We eat a lot of red meat around here, so I’m always looking for great alternatives. Can’t wait to try! You do 🙂 !! Thank you Sara! They are a nice alternative to meat! I love having a variety of sandwich fillings! And I agree black beans are sooo good for you. It’s a shame that sometimes they’re only an afterthought or just as a side. I can’t wait to try them in a sandwich. I’ve never been that fond of burgers, but I have to break down and try some of these bean burgers! (I am fond of beans… LOL) The seasoning in these sounds so good. You do! They are pretty delicious! We have them often around here 🙂 Hope you like them too! Guurrrrllll!!!! Your burgers are killing me! I want to eat them all! I guess I can call this one healthy because it’s black bean and vegan? LOL! #needtoexcercise #noimpulsecontrol! I feel so much better enjoying a burger when it’s a black bean burger Dawn! And these look awesome! I love freezing them too so I’ve got them when the craving hits! Pinned! You can never have too many burger recipes. Although we are “meat eaters”….we do have a few “meat free” days a week. This would be perfect for one of those days. I’m on a huge black bean kick lately, and I was just saying to my husband the other day that I wanted to make black bean burgers! (I’ve also been on a burger kick lately!!). I guess I don’t need to look any further for the recipe! I’ll be bookmarking this one to make soon. Thanks Dawn! Happy Monday! We love black beans in our home and we go through them like crazy!! And you can never go wrong with a burger, especially thing time of year 🙂 Hope you enjoy this one, Leanne! Let me know if you try it out! Happy Monday to you too, my friend. You’re killing it with the process shots! For real, they’re awesome :). Also awesome are these burgers. I loooove a veggie burger and these sound totally perfect. Have a great week, Dawn! I have always wanted to try to make a burger like this. I had one at a picnic a few years ago and I was hooked. Definitely going to give this a try because it looks so good! These black bean burgers look absolutely delicious! I love that crust you get when using a cast iron skillet. It adds such great flavor! I wouldn’t care one bit that these are vegan! Scrumptious eating here my friend! Looks way too inviting for me to resist biting into this burger! You do know how to do black beans! Pinned. Such a great healthy alternative to the classic burger. Will be sending this on to my daughter, as well. She will love it too! Thank you Jennifer! It sure is 😉 Hope she does! Have a wonderful week!